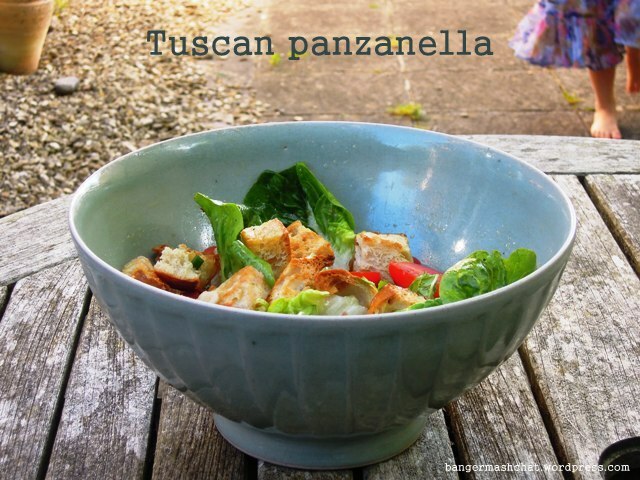 Panzanella is a tasty and satisfying Italian summer salad, perfect for picnics and eating al fresco. We enjoyed it last weekend when the sun was shining and it felt like we were on holiday in our own garden. The weather has sadly turned greyer and damper, but I am hopeful the blue skies will return. Hope, hope! I took this recipe from a cookery book called Yolanda’s Kitchen, written by Yolanda Pearson who was born in Normandy to a French mother and an Italian father. With that kind of a background, it’s not surprising Yolanda can cook. Yolanda is a good friend of my husband’s family. As a boy, Jason used to play with Yolanda’s son Simon whenever they visited their holiday cottage up in Shropshire and he has very good memories of eating well at their house. This traditional Tuscan snack gets its name from the ‘Zanella’, the ditches by the side of the fields where the farm labourers used to sit to eat their lunch, and ‘Pane’ (Italian for bread). Thus they mixed leftover and dried-up chunks of bread with whatever salad ingredients their vegetable patch had in season, hastily dressed with wine vinegar and olive oil and enjoyed in the open air as a one-course meal. I find the salad is enough on its own for a good lunch. I’ve been taking it to work this week in my lunchbox, and it’s surprising how crispy the ciabatta stays even when it has soaked up some of that tasty dressing. I do have to apologise though when I open it up, as it rather reeks of garlic! It’s also good as part of a picnic or served as a side dish with a barbecue. Preheat the oven to 160°C / gas mark 2-3. Cut the ciabatta into bitesize cubes, place them on a baking tray and bake in the oven for 5 to 10 minutes, until it gains just a little colour. Leave to cool. Peel, deseed and slice the cucumber. Finely slice the spring onion. Dice the celery. Mix together with the crushed garlic. Cut the plum tomatoes in half. Yolanda says here to remove the seeds, but I must admit I didn’t bother with this bit. In a large salad bowl, mix together the bread, tomatoes, lettuce leaves, chopped vegetables and torn leaves of basil. In a small bowl, mix together the oil, vinegar, sugar and salt and pepper. As this is salad is perfect for picnics and outdoor dining, I’m entering into Four Seasons Food, a wonderful new challenge hosted by Chez Foti and Delicieux. The theme for the start of summer is Picnic Food & Outdoor Nibbles. And as it contains lots of fresh basil, I’m also entering it into Lavender & Lovage‘s ever-popular Herbs on Saturday challenge. Looks great and is so easy even I can make it. Good thing you were able to enjoy your salad last weekend – where did summer go? But I will use your idea soon, rain or shine! I ate it again for lunch today and it made a grey day feel positively sun-shiney! 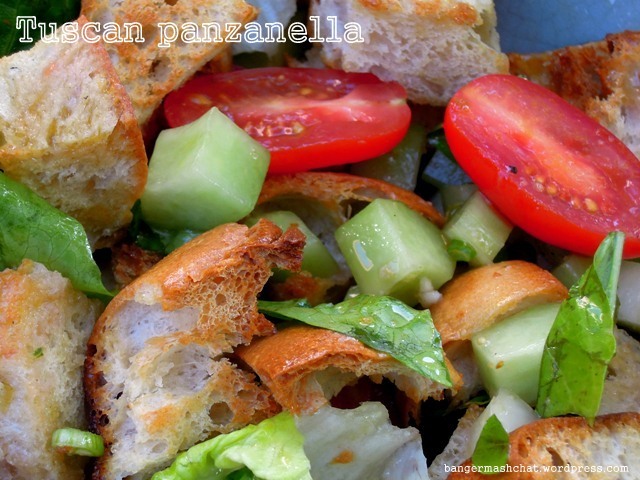 We suggest to eat Panzanella. It is my favourite tuscan dish!!!! 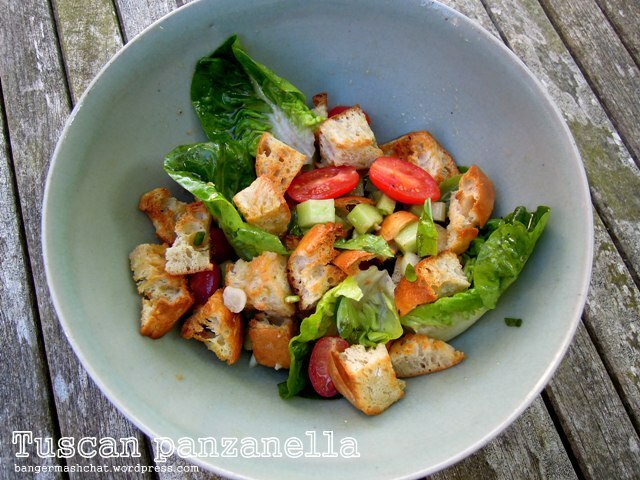 Oh I love Panzanella and your’s looks divine! Hopefully you’ll get some sunshine again soon and can enjoy eating such fab outdoor delights. Thanks for entering Four Seasons Food, I’d say it’s the perfect outdoor summer salad!